The LT model is a parallel poly tank side mount lift designed for rough water, wide slips, and back over applications. All steel above the water line in most applications, aside from bushing maintence you won't have costly repairs replacing steel parts that corrode the harmful properties of water. For those challenging water depth applications. LOTO Lift ® builds the lowest operating pneumatic lift in the country. Before now there has been nobody has put so much into the shallow water concept. Using rectangular tanks is the most efficient way to displace water. That is why river barges are designed square not round. 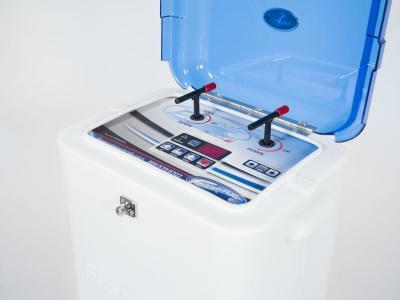 Our 4000 shallow can operate in as little as 24" water for bass boats. All hot dipped Galvanized frame, poly bushings in every moving part, optional non fiction composite bunks. We will keep you fishing or wake-boarding all year! At Loto Lift we do the lifting for you! Your boat is one of your biggest investments and the Loto Lift team will help you protect it. 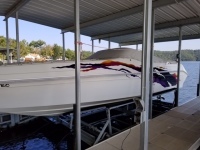 Using the latest technology and pneumatic boat lift brands, we customize boat lifts, docks, and accessories based on your needs. We also offer service, repairs and installation, so the only thing you’ll have to lift is your finger to give us a call for a consultation. We proudly serve Lake of the Ozarks, Grand Lake, Truman Lake, Smithville Lake, Pomme De Terre, and Table Rock Lake. ***Due to overwhelming new sales, we are not servicing any other brand than LOTO Lift until further notice. 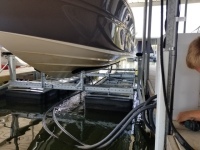 Having problems with your boat lift? Do you have a boat lift or dock that needs to be relocated? Do you need your dock repaired? 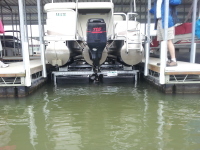 At Loto Lift, we are pneumatic boat lift specialists. Loto Lift will make sure your boat lift and dock are repaired, removed, or replaced properly and quickly. We cover Missouri lakes: Lake of the Ozarks, Pomme De Terre Lake, Smithville Lake, Long View Lake, Rain Tree Lake, Blue springs lake, Table Rock, Truman, Missippi River, Missouri River and any privote lake inbetween. 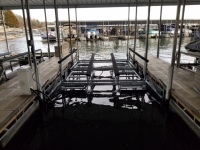 A boat lift / lake lift can be the most convenient part of your boating experience. 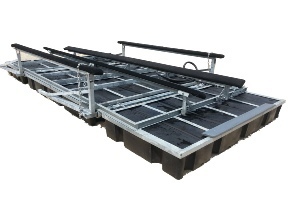 A boat lift / lake lift is designed for a number of reasons. It reduces wear, keeps the hull clean, and provides protection from rough water while in a dock slip. On top of all of that it is convenient for accessing out drives and repairing the prop, swim deck, or the hull of a boat. Most inland boats are constructed of a fiberglass hull that is sealed with gel coat or a epoxy paint that provides adequate protection for the fiberglass, but prolonged saturation from sitting in water will affect byproducts formed in the hardening process turning them in to acids that will break down the bond between the glass reinforcing and the resin. Power boats have precise parts and drives that need to be keep clean for performance and durability. With zebra mussels and marine growth it would be impossible for the boat to run correctly with water ports, jets, and the drives clogged. When you add electrolysis into the equation the odds of permanent damage are high the boat in the picture had been in the water for 3 months before it was put on this shallow water boat lift. At LOTO Lift we do the lifting for you! A boat is meant to be a dream that brings you excitement, joy, and much needed relaxation... but without properly securing and protecting, it can be a nightmare that makes you regret the decision to become a boater. At LOTO Lift we understand what is at stake and want to help ensure that your boating experience will be a pleasurable one. 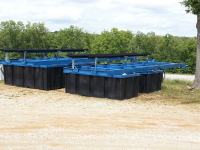 We have the newest designed parallel poly tank lift system on the market. 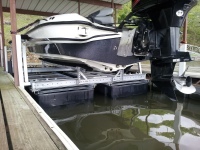 Utilizing custom roto molded tanks specifically manufactured for the boat lift application. Keeping all the steel out of the water will keep the dollars in your pocket (or fuel tank, coolers, and water toys) where they belong. 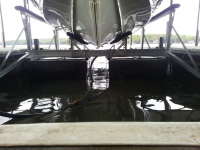 We manufacture boat lifts and accessories to shield your boat from rough water, electrolysis, and harsh marine growth. We only service and repair LOTO Lift products to provide best convenience & reliability when it matters most. Thank you for trusting LOTO Lift to protect your dream!